Rich interior accoutrements, Volvo IPS pod drives, and crisp lines make this new Sabre a sweet ride. Every year at the Miami International Boat Show, top builders reinvent their lines in a kind of low-level arms race to grab the attention of the affluent Topsider crowd strolling the docks in search of new toys. At the most recent show, Sabre Yachts served up yet another new and elegant cruising machine, the Sabre 54 Salon Express, which joins builder's 38 Salon Express, 42 Salon Express, and 48 Salon Express models. 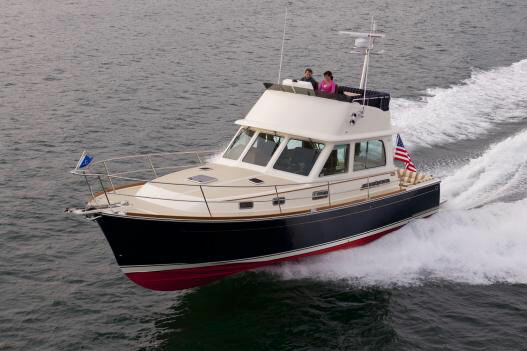 Redesigned for 2014, this Downeast beauty and flagship of the Sabre line showcases an even higher level of craftsmanship, a few creative twists on the traditional layout, and lines that are prettier than ever. Looking for a cruising boat to draw longing stares when pulling into Nantucket for the annual wine festival? This could be your ticket. 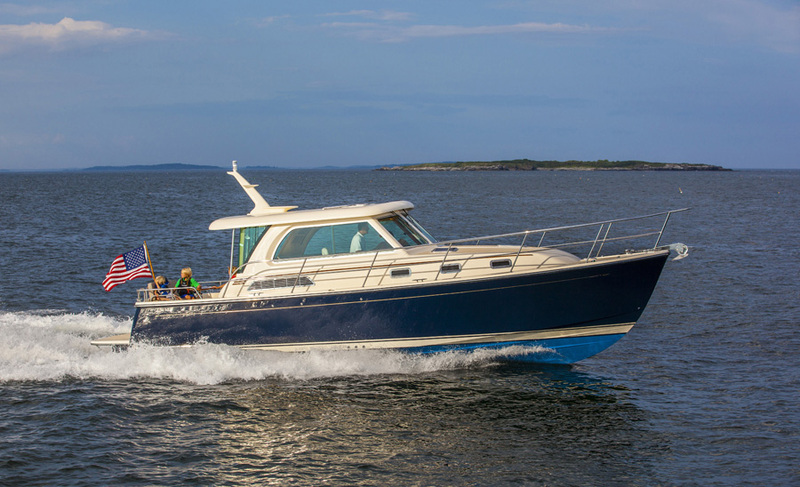 Eye-popping performance, great-looking lines, and a well-crafted interior are all part of what make the Sabre 54 Salon Express a great Downeast express boat. 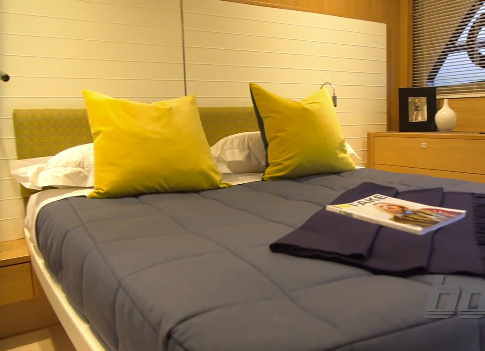 It’s a two-stateroom model that’s ideal for a couple who plan to cruise with good friends or family, and because those accommodations are set in the boat’s broad 16-foot beam, they’re plush indeed. The forward guest stateroom with queen berth and private head is well done. The surprise here, though, is the master cabin, which is located amidships, where wave noise and motion are minimized. The area is made private with Shoji-style pocket doors that save space and open with a sophisticated swoosh. Eye candy comes in the form of woodworking details. They’re top-notch, and showcased on the inlaid headboard and tabletops. A second Shoji door opens to the master head with designer details (see the glass sink and tiled floors) and an oversized shower stall. 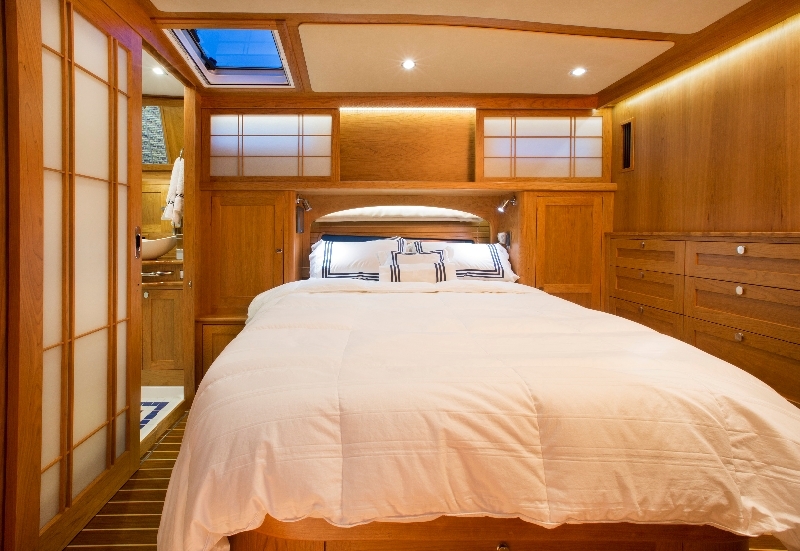 Shoji-style doors and accents give the Sabre 54 Salon Express a unique feel down below. Sabre created a galley-down arrangement on the 54. It’s located on the accommodations level to free up more usable space in the salon for entertaining. Yet the galley isn't like some others that sit close to the waterline. Thanks to overhead windscreens and large opening ports, it’s as bright as it is well-equipped. You’ll find everything here including the galley sink, from two sets of drawer-style fridge/freezers to a dishwasher and built-in coffeemaker. We like the quartz counter tops. The natural stone is elegant enough to serve as a prep space for great wine and gourmet cheeses, yet it has the hardworking performance attributes a foodie needs for slicing and dicing his or her way through daily meals on an extended cruise. The age of excess is alive and well in the salon of the 54. The high-gloss finish of handcrafted tables, the just-right joinery, and the stitched fabrics on the settee are played up by all of the natural light that comes in through the oversize windows and electric sunroof. And at the helm, there’s not one, but two Stidd helm seats. 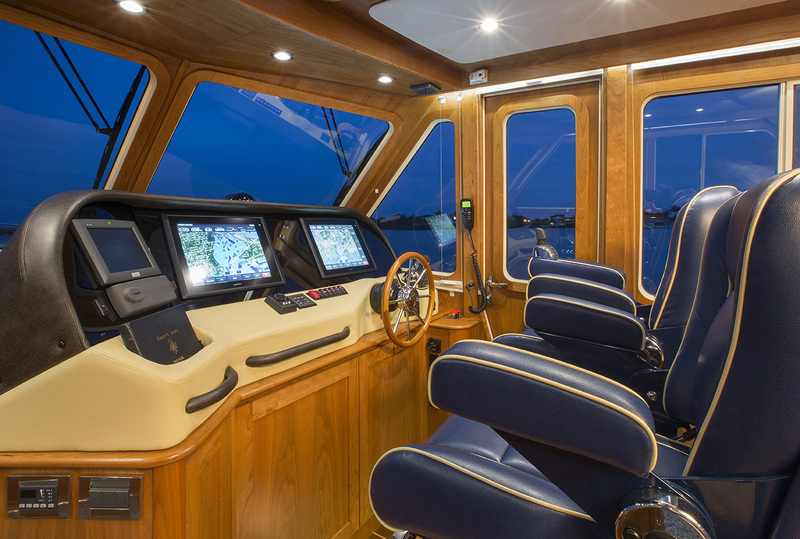 To starboard of the helm, a weather-proof hinged door gives access to the side deck. If you haven’t yet cruised with this feature before, once you do, you won’t want to go back to the days of hotfooting it aft to double check lines prior to a dock approach. 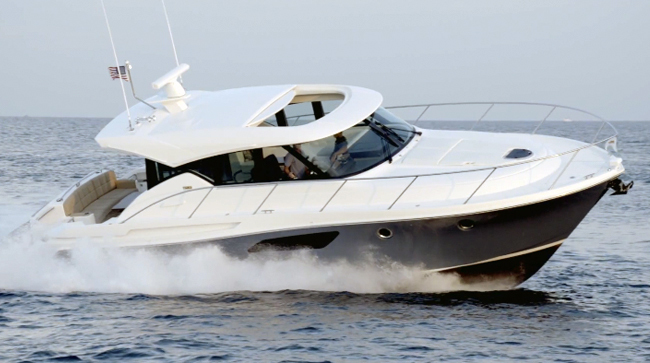 The helm of the Sabre 54 Salon Express puts the captain at the control of twin Volvo IPS drives that crank out 725 horsepower each. From the helm, the skipper operates a pair of Volvo Penta IPS 950 pod drives, which deliver 725 horsepower each. 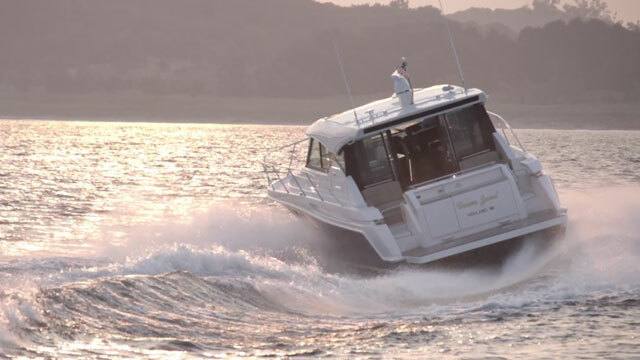 The IPS drives push Sabre’s proven, easy-riding hull to a cruising speed of 28 knots. At that pace, reports the builder, the 54 burns about 44 gallons per hour for a range of 350 nautical miles. Sabre says this new model is also one of the quietest in its class, boasting sound levels as low as 74 decibels at cruise. The IPS drives are controlled by a joystick, which means the 54 should be a kick to run out in the bay, slaloming around lobster pot buoys. 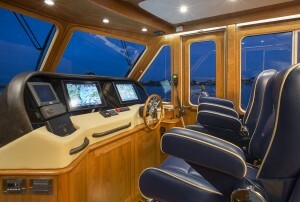 The joystick will also ease stress for the skipper when he or she is docking the 54 in a tight space. Like all Sabres, the new 54 is built for bluewater work and for yachtsman who take their cruising seriously. Along with salty details, such as handrails all along the sidedecks and aggressive diamond-pattern nonskid, systems are both reliable and easy to understand. On the DC electrical panel, for instance, just one switch opens all house battery circuits. Individual circuit breakers are on a more complex panel in the engine room. 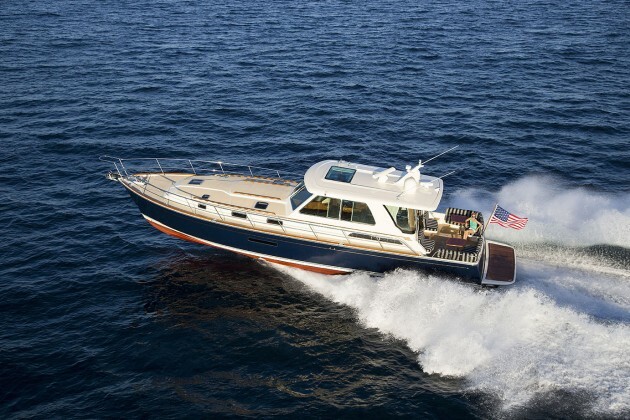 Sabre likes to say that because its semi-custom boats are built in Maine, they possess a tradition of craftsmanship and classic American style. The new 54 Salon Express seems to prove that true. Just watch those heads turn at the Nantucket Boat Basin this summer. 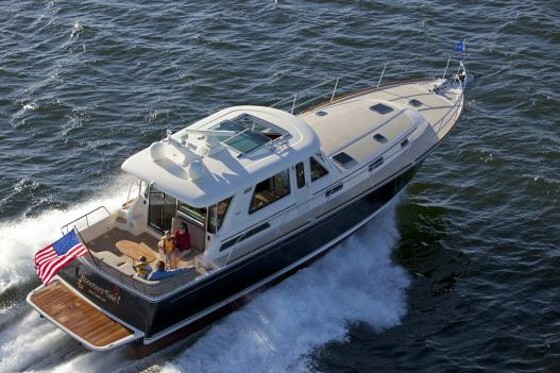 See all Sabre Yachts listings.